Warrington Property Maintenance Ltd., were formed in 1969 by William and Edith Warrington originally known as W Warrington Painting Contractors. We started in very humble beginnings with William even building his very first timber ladder. Early transport was a Morris J type van which has garnered such a respect for the workhorse vehicle that even today we own and restore a small fleet of the vans. 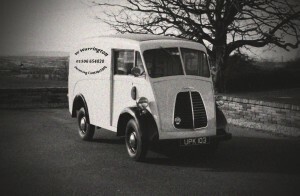 You can find out more about our restoration work at our associated website: www.jtypevan.org.uk. In order to build the company we diversified into the refurbishment of buildings and painting of commercial vehicles including sign writing. Eventually the company transformed itself to become Warrington Property Maintenance. It wasn’t long before contracts were gained from notable companies of the time such as the major house builders Roy of Stirling and the large and well known haulage company, Griffiths transport. Others followed such as Matt Purdie & Sons with whom we established an excellent working relationship helping maintain their large fleet of vehicles as well as their extensive property portfolio. By the late seventies the list of contracts had steadily increased to include local authorities such as Edinburgh District council. In 1986 the company was expanded by the inclusion of family members with initially Derek Warrington and later Colin Warrington joining after studying architecture at Aberdeen University. We became a limited company in 2002. Derek, Colin and William are still directors of the company. Today our extensive list of clients includes various local authorities and housing associations as well as numerous national insurance companies, property factors and retail shopping centres. We have a large and varied commercial and residential property rental portfolio and undertake building contracts as well as repairs and refurbishment. We currently employ a staff of 30 as well as a range of ‘all trades’ sub-contractors and operate from our main operational depot at Whitehill industrial estate in Bathgate as well as various other storage, yard and administration facilities around West Lothian. We also have a regional office in Glasgow.